Thomas Gainsborough, one of the founders of the Royal Academy of Britain, was born around 1727. He was one of Britain’s foremost portrait artists, and a great rival of Sir Joshua Reynolds. The artist, who displayed his talents at a very young age, was also a printmaker, a draftsman and landscape painter. 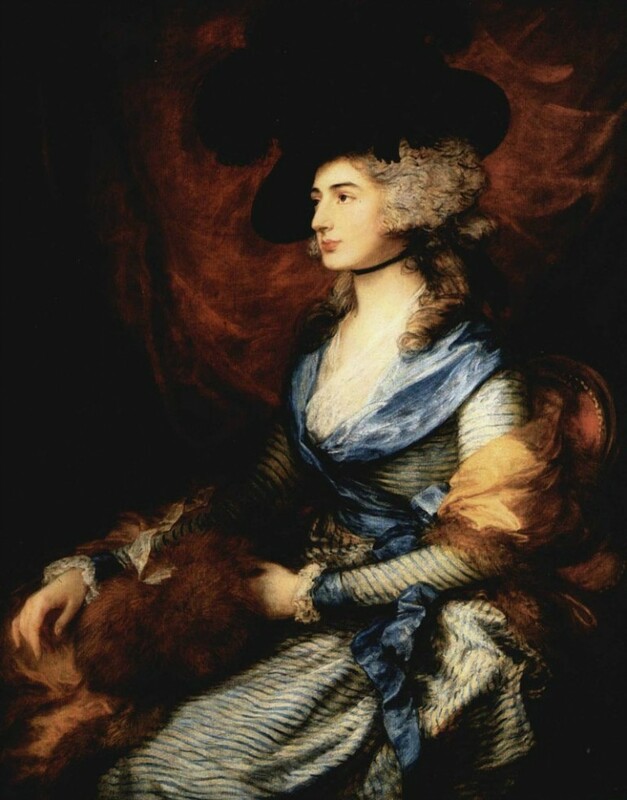 Rivals Joshua Reynolds and Gainsborough were poles apart in terms of temperament and style. Reynolds was very conscious and displays sophistication in his portraits. On the other hand Gainsborough, whose works showed easy strokes and a light palette, created portraits with unconscious disregard, mostly following his intuition. Although he was a brilliant portraitist who surpassed the talents and renown of Joshua Reynolds, he was inclined more towards landscape painting. One can consider Thomas Gainsborough a renegade as he did not have an affinity to institutions and respectability. He only did portraits because of economic necessity. His work was very English in nature and he was considered a natural genius. He was on equal footing with Joshua Reynolds as a colorist and had the sensitiveness that Reynolds lacked as a draftsman. He considered portraiture as work while landscape painting was a pleasurable activity. Thomas Gainsborough was from East Anglia, just like other English landscape artists such as John Sell Cotman, John Constable and John Crome. Just like these three painters, his main source of inspiration were the landscape masters from the Netherlands. His father was a shroud maker and clothier, and the young man displayed his talent for art at an early age, inspired by his beautiful surroundings. He was sent to London in 1741 when he was 15 years old and had a series of teachers. He was taught by Francis Hayman, a historical and portrait painter from Devonshire, when he was at the St. Martin’s Lane Academy. Hayman was also a founding member of the Royal Academy of Art. He gained success when he set up a studio at Ipswich, where he met and befriended Landguard Fort governor, Philip Thicknesse, who became his patron. Thicknesse encouraged him to broaden his client base, thus Gainsborough moved to Circus at Bath, a newly constructed building, in 1760. Within eight years, he managed to gain wider acceptance and solid reputation, which earned him an invitation to become one of the Royal Academy of Art’s founding members. After 14 years in Bath, Gainsborough moved to London and this was where his rivalry with Reynolds became serious. Because of his good reputation and his skills, he received plenty of commissions and was actually overwhelmed by them. He also became the royal family’s favorite painter and did portraits of Queen Charlotte, King George III and even did paintings of the Windsor Castle. During the first phase of Gainsborough’s career and drawing upon the inspiration of the Dutch realist painters, his works, both landscapes and portraits, showed close composition and precision. His works were very thorough and meticulous, imbued with his own personal style, which showed elegance and daintiness. It was a result of his natural instinct and personal reaction to nature and art. His second phase showed a marked difference from his earlier works. He was less meticulous and his handling became less delicate but more lively. Innate features such as enduring and permanent quality were brought forward by Reynolds in his portraits. Gainsborough on the other hand featured something less permanent and transient, those things that you barely notice and are gone before you see them. That was a trademark of Gainsborough in his portrait art, because he was sensitive to these fleeting features. If one is to compare, Reynolds’ portraits of children showed sentimentality and a bit of coarseness, with the concept of a happy childhood implied. While they can be pretty, the children’s portraits of Gainsborough show the unconsciousness and the refined fragility inherent in young children. His mature works showed expressiveness in the subjects’ faces, a delicate and keen sense of beauty and an unbelievably unforced and subtle grasp of character. Viewers could feel a sense of throbbing and fresh life, shown with limitless lightness of touch and freedom in his use of pigments. He was quick to catch the likeness of his subject, something that Joshua Reynolds lacked, and was able to catch that fleeting expression that brought life to his portraits. 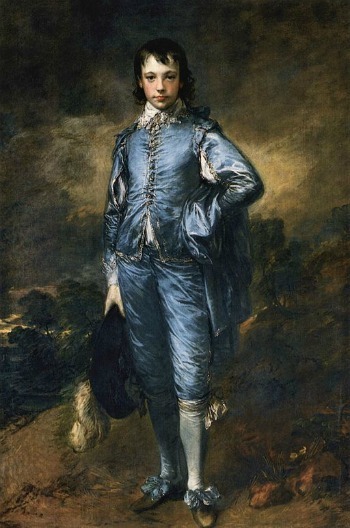 “The Blue Boy” is one of the most well-known portrait painting of Thomas Gainsborough.